From its humble beginnings in 2005, the International Network of Customs Universities (INCU) has come a long way. The primary motive for establishing the network was to promote the academic standing of the Customs profession – something that was clearly needed at the time, and which, I am pleased to say, has been well and truly achieved in the intervening ten years. As the INCU celebrates its 10th anniversary, it is worth recalling at least part of that journey, and contemplating what might lie ahead. I recall the day I first proposed the development of a Master’s degree with a Customs specialization. One of my professorial colleagues asked why one would need a Master’s programme to teach people how to search bags. Those of you who are involved in trade and Customs matters, and who understand the breadth and complexity of the subject, would have shaken your head as I did. There is far more to the Customs profession than baggage search! But that was the perception some 15 years ago, and it was that perception which prompted the establishment of the INCU. Recognizing the academic significance of Customs and border management, a small number of universities had already developed Customs-specific qualifications and research streams in the 1990s, notably Münster in Germany, and Canberra in Australia. And while national endorsement of such programmes represented a significant step forward, it was international acknowledgement that was required before Customs studies could be recognized as a true academic discipline. To this end, the INCU has been working closely with the WCO to further this cause, and together we have developed formal standards for the Customs profession, globally recognized academic programmes, an academic journal that is about to enter its tenth year of publication, and a series of international conferences that focus on academically-recognized research and development. Notably, neither the WCO nor the INCU could have achieved this outcome independently of one another. While international policy-making is beyond the jurisdiction of the INCU, it can significantly support such decision-making through its extensive research initiatives. Similarly, the WCO cannot award academic degrees, but can influence the development of programmes that lead to such qualifications by formally recognizing those which meet the professional requirements of its Members. The experience to date has served to highlight the natural synergies which exist between the two organizations. Like many partnerships, the whole has proved to be much greater than the sum of its parts. The key to such a synergistic relationship lies in the fact that competition does not and cannot exist. While common areas of interest are shared, each organization has its own agenda and its own imperatives. Each pursues its charter to the satisfaction of its Members, and each is given the opportunity to further the achievement of its objectives by actively participating in the activities of the other. This is recognized by the fact that both organizations feel compelled to collaborate with other organizations in areas which touch on their particular sphere of activity. From an INCU perspective this includes some 20 international organizations. For the WCO it involves many more, as it recognizes the important role that many international organizations play in developing and facilitating international trade and travel, including the associated Customs and border management policies. In progressing its charter, the INCU has recently introduced global conferences that are designed to complement the WCO’s PICARD Programme by establishing a forum that provides its Members with a greater opportunity to present the findings of their research activities in the field of Customs and international trade, and allows younger researchers and students to present their research proposals to the broader research community. The Inaugural INCU Global Conference was held in Baku, Azerbaijan in May 2014, with the theme ‘Trade Facilitation Post Bali: Putting Policy into Practice.’ The conference brought together delegates from over 70 countries, including representatives of Customs administrations, 20 international organizations, the private sector, and academia. The conference was also the first of its kind to provide simultaneous telecast via YouTube – clearly a sign of the times! Proceedings included a welcoming address by the Director General of the World Trade Organization (WTO), Roberto Azevêdo, keynote addresses by three eminent Nobel Laureates, the Assistant Secretary for International Affairs of the United States (US) Department of Homeland Security, and a number of other highly respected speakers. Among them was the Chairman of the State Customs Committee of Azerbaijan, Professor Aydin Aliyev, who was admitted as an Honorary Fellow of the INCU in recognition of his significant contribution to the objectives of the organization. A key outcome of the conference was the Baku Resolution, which recognized and built upon the significant achievement of the WTO in reaching its Trade Facilitation Agreement (TFA). Among other things, it was resolved to formally engage with a broader cross-section of the international community, and identify further ways of providing opportunities for academics, students and less experienced researchers to present and publish their research. Another important resolution was to develop a definition of the term ‘Customs profession’ which includes both public and private sector members of the international trading community, identify the requisite knowledge, skills and competencies of those engaged in the Customs profession, and develop guidelines for accrediting education and training programmes that meet the identified knowledge, skill and competency requirements. This further builds upon the excellent work undertaken to date in collaboration with the WCO. To further support the development of accredited qualifications, it was also resolved to encourage mutual recognition of INCU Member education and training programmes through credit allocation, cross-institution arrangements, and other means. This is already occurring, with formal arrangements having already been established across a number of educational institutions in Australia, China, Germany, the Maldives, Qatar, Sri Lanka, Tanzania, and the US. Continuing collaboration with the WCO, other international organizations, and member institutions will certainly provide the basis for future activities, as will focused research designed to inform strategic policy making. 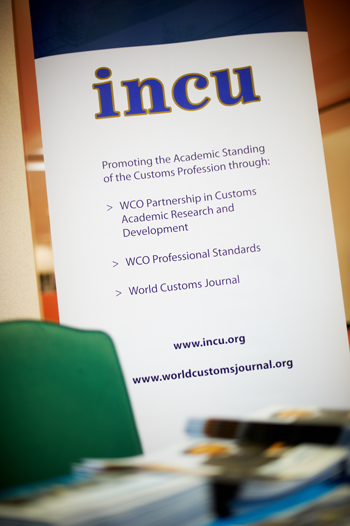 It is in this context that the INCU looks forward to its next ten years of working closely with the WCO as we collectively progress our endeavours in Customs academic research and development in order to further raise the academic standing of the Customs profession.